Rabbi Tirzah Firestone, author of Wounds Into Wisdom: Healing Intergenerational Jewish Trauma, will give a talk on the groundbreaking exploration of the long-term effects of historic Jewish trauma and the remarkable account of how individuals and families around the world are reshaping their future. The lasting effects of individual trauma are now widely recognized. But what of the consequences of extreme trauma on an entire ethnic group? New research in neuroscience and clinical psychology demonstrates that even when they are hidden, trauma histories—from persecution and deportation to the horrors of the Holocaust—leave imprints on the minds and bodies of future generations. 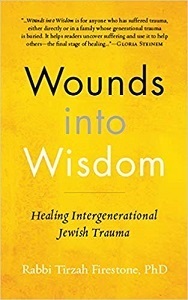 Wounds Into Wisdom makes a compelling case that trauma legacies can be transformed and healed. Fusing contemporary neuroscience, psychology, and ancient Jewish wisdom and values, this work provides a roadmap for Jews, and all individuals and groups with trauma history, who wish to seize the power to change their lives. As a rabbi and psychotherapist who has studied and counseled hundreds of Jewish families and individuals for over 30 years, Tirzah Firestone brings to life these real people who have surmounted their tragedies. Her captivating stories demonstrate how past trauma is shaping our lives today—from the timid young woman who discovers she has been repeating her lost grandmother's exact words, to an Israeli war hero who has endured decades of terrifying nightmares. Just east of Beverly Glen Blvd.